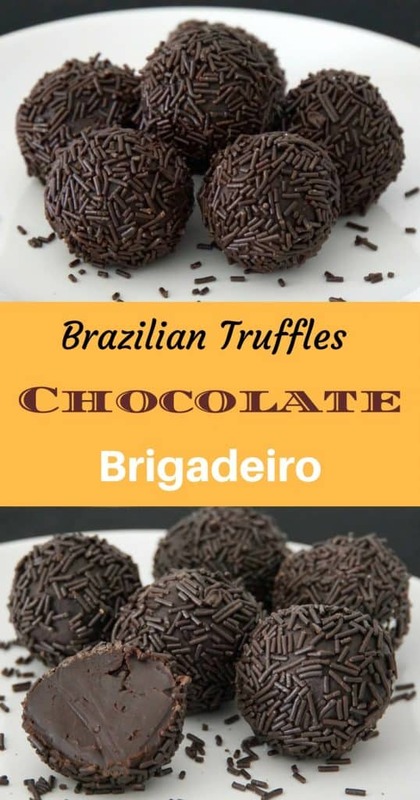 Brigadeiros are a favorite dessert treat in Brazil. 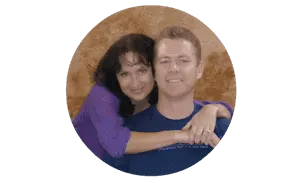 You can find them in stores, restaurants, vendor carts on the street and in homes throughout the country. These lovely chocolate truffles are sweet perfection in three simple ingredients. 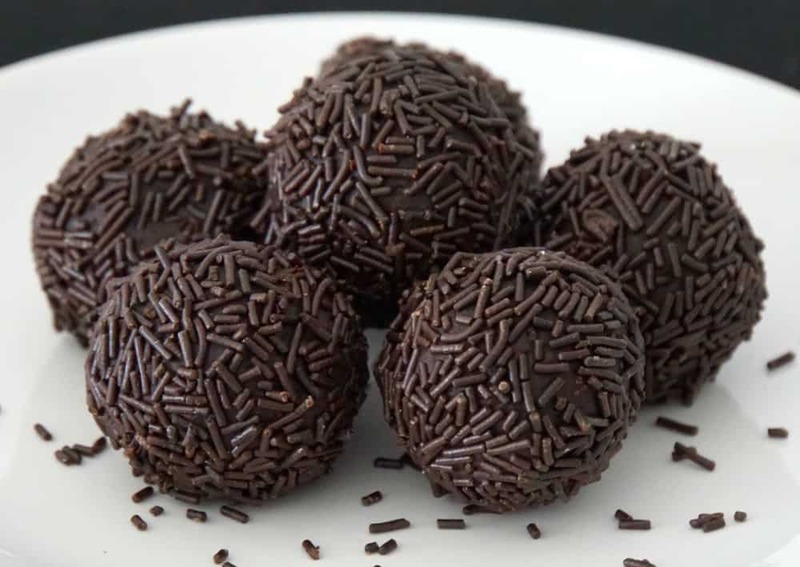 There are several variations of Brazil’s beloved truffle, but the most common preparation being a cocoa truffle rolled into 1 1/2″ balls and covered with chocolate sprinkles. Other popular styles include serving the creamy mixture in small jars or, my favorite, scooped out and served as a bite sized portion directly on the spoon. It’s a perfect little touch to accompany a cup of coffee (or glass of champagne) after dinner. The Brazilian chef who introduced brigadeiro to us also quipped that this was the best dessert for soothing a broken heart. Sometimes a bowl full of warm chocolate and a good cry is all you need to make the world right again. Taking a spoonful and allowing it to slowly dissolve in my mouth, I realized she was completely right. There is no doubt, however temporarily, that life is transformed for the better with the addition of a gooey chocolate dessert. It certainly was for me. 1 14 oz can Sweetened Condensed Milk. Add all of the ingredients to sauce pan over medium to medium-high heat. Stir the mixture constantly and bring it up to a full boil. Continue to stir until you begin to see the mixture clumping on the side of the pan. Remove from heat. Mehtod for serving on a spoon: Add a scoop to a metal spoon and set it aside, working until the whole mixture has been used. Top as you like with sprinkles, chopped nuts or sugar. Allow to cool, indulge and enjoy. Method for Forming Brigadeiro Truffles: Spread the chocolate mixture on a greased cookie sheet to cool. When it is cool enough to handle, butter your hands, scoop out a teaspoon full of the mixture and roll into 1 1/2′ balls. 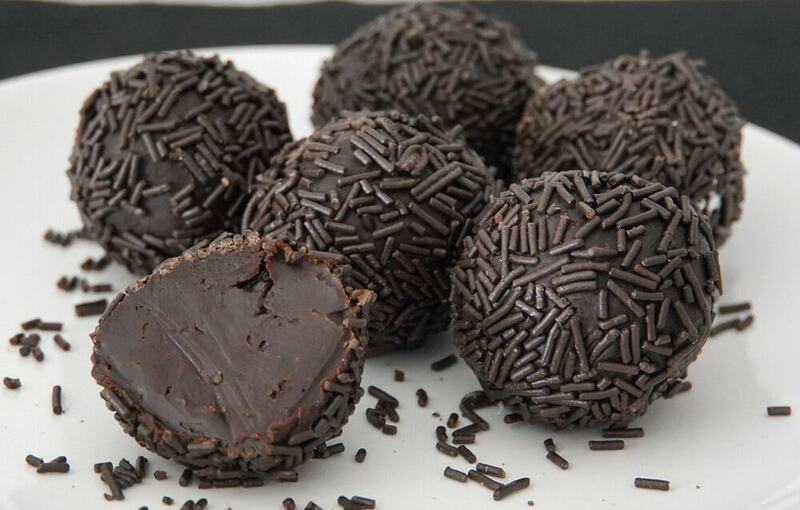 Roll the truffles in chocolate sprinkles, sugar, or in chopped nuts as desired. Visit our International Recipes section to see our full collection of recipes inspired by our ongoing travels around the world. A special thank you to our friends at Cook In Rio for introducing us to the dessert!